Versele-Laga Happy Life dog food is a very inexpensive yet complete, fully balanced and very tasty diet for the dog. 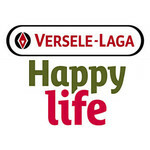 Versele-Laga Happy Life dog food consists of high quality ingredients and is easily digestible. Available in the following flavors: Chicken, Lamb or Beef.